festival schedule 2012 Friday, October 5th 1:00 pm Aviation Cocktail (US, 97 min) | feature film Quad Cinema 3:00 pm Jules Dongu (US, 92 min) | feature film Quad Cinema 5:00 pm Last Day of August (US, 75 min) | feature film Quad Cinema 7:00 pm Opening Night Premiere: Quad Cinema Chasing Home (US, 84 min.) | feature film 8:55 pm Finding Focus (US, 81 min.) | feature film Quad Cinema 10:45 pm Red Kingdom Rising (UK, 73 min.) | feature film Quad Cinema Saturday, October 6th 1:00 pm Hot Hot Hot (Lux./Austria, 90 min.) | feature film Quad Cinema 3:00 pm Underground Hip Hop In China (63 min.) | doc. Quad Cinema 5:00 pm Short Film Selection I Quad Cinema The Bouncer Dissonant Frequencies Singularity Reprise 6:55 pm The Exam (Hungary, 92 min.) | feature film Quad Cinema 8:45 pm Indigo Children (US, 75 min.) | feature film Quad Cinema 10:20 pm Graders (UK, 94 min.) 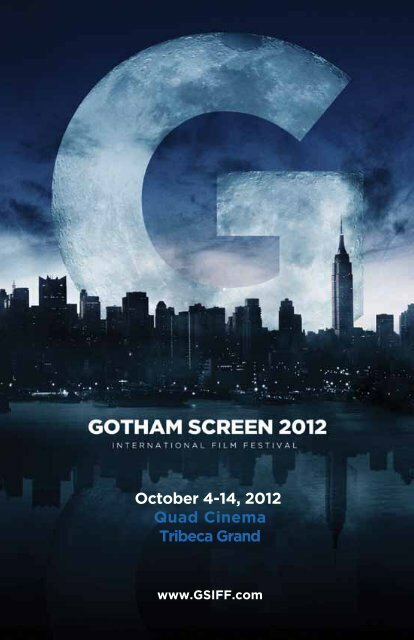 | feature film Quad Cinema Sunday, October 7th 1:00 pm $1 Movie (US/Italy, 90 min.) | feature film Quad Cinema 3:00 pm Kosmonavtika (Russia, 71 min.) | feature film Quad Cinema 5:00 pm My Father and the Man in Black (US, 90 min.) | doc. Quad Cinema 6:55 pm Rice Paddy (China/France, 80 min.) | feature film Quad Cinema 8:35 pm The Citizen (US, 99 min.) | feature film Quad Cinema 10:35 pm Ham and the Piper (UK, 80 min.) | feature film Quad Cinema Monday, October 8th 1:00 pm Finding Focus (US, 81 min.) | feature film Quad Cinema 3:00 pm Chasing Home (US, 84 min.) | feature film Quad Cinema 5:00 pm $1 Movie (US/Italy, 90 min.) | feature film Quad Cinema 7:00 pm A Trip (Slovenia, 85 min.) | feature film Quad Cinema 8:45 pm Short Film Selection II Quad Cinema Spaghetti for Two Chalk Talk, Little Kaiju Mr Bellpond Yeah Rite 10:15 pm Aviation Cocktail (US, 97 min) | feature film Quad Cinema go to www.gsiff.com to buy tickets.